Composting is an important way of upcycling leftover food and combating rampant food waste in America. Composting also replenishes topsoil by adding back nutrients and vital microorganisms. You can compost most food and paper in a bin with worms (vermicomposting), and there are a variety of systems to compost food scraps in your backyard, but what can you do with the leftover meat and dairy that other composts won’t take? Bokashi is a perfect solution. 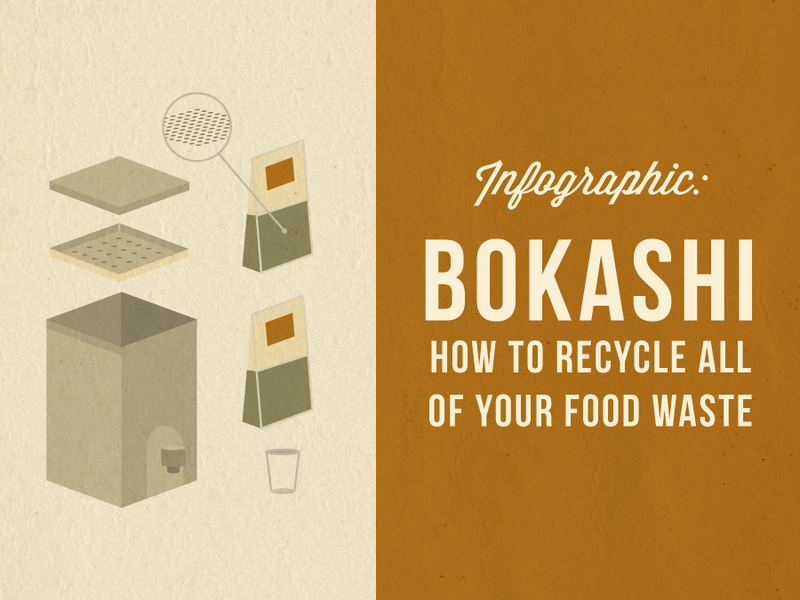 Use this infographic to get started recycling your food waste with Bokashi today! Bokashi is a mixture of microorganisms that is known as a bokashi ‘bran’, and it has its origins in the Far East. The roots of bokashi are found in the natural farming methods traditionally practiced in Korea, and in the discovery of essential microorganisms in Japan by Dr. Teruo Hiya in the 1980’s. Dr. Higa’s special blend of EM (essential microorganisms) came out of studying the ways that microorganisms were beneficial to plant growth. His blend was first used in 1982 in Japan and now is marketed in 120 countries worldwide. If you want to make your own bokashi mixture, it’s not necessarily easy, but there are some great online resources for DIY types. If you’re buying pre-made bokashi bran, keep in mind that a 2 lb supply should last you about 3 months per bokashi bucket. Bokashi is odorless and pest free because it works with an airtight anaerobic process of fermentation. The bokashi bucket must be completely airtight with a faucet at the bottom so you can drain out the ‘tea’. There are lots of great bokashi buckets and systems for sale online, or your can build your own using some simple guidelines. Bokashi ‘tea’ is a nutrient rich liquid that forms at the bottom of the bokashi bucket as a result of the heat created by the composting process. You’ll want to drain this tea every few days and either use it to water your plants and garden, or pour it down the drain – it’s great for clearing out clogged drains. One of the best things about bokashi composting is that you can put meat and dairy in the bin, foods that are difficult to compost with other methods. The other plus is the speed of bokashi composting – it takes only 2 weeks to compost a full bin of food waste. Additionally, the lack of smell and airtight nature of the containers make them perfect for indoor and apartment composting. If you want to keep composting continuously, it’s best to get two buckets. That way you can fill one bucket with waste and then begin filling the other bucket while the first is going through its 14-day fermentation cycle. When the bin has finished its 14-day fermentation cycle, take the fermented food waste and bury it. If you have a garden, bury it right in the soil under a few inches of dirt and you’re done. If you live in an apartment, dedicate an empty pot, fill it with soil, and use it to bury your fermented food waste. Once the fermented food waste is buried, it will break down completely in about 2 weeks – again you don’t have to worry about any bad smells or pests. The soil that you have created is packed with nutrients and healthy microorganisms. Spread it around to your plants, donate it to a local community garden, or create a kitchen herb garden. Whichever way you decide to compost, you can be sure that you are doing your part to curb the problem of food waste in America by keeping that waste out of landfills. You’ll also be contributing to the creation of new healthy top soil. Healthy top soil is one of the most critical components for growing food on this planet. 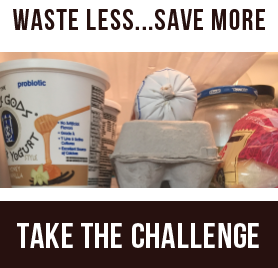 So in addition to composting, make sure you only buy what you need, eat what you have in your fridge, and learn more about food expiration dates and what food items you can freeze to extend their shelf life. 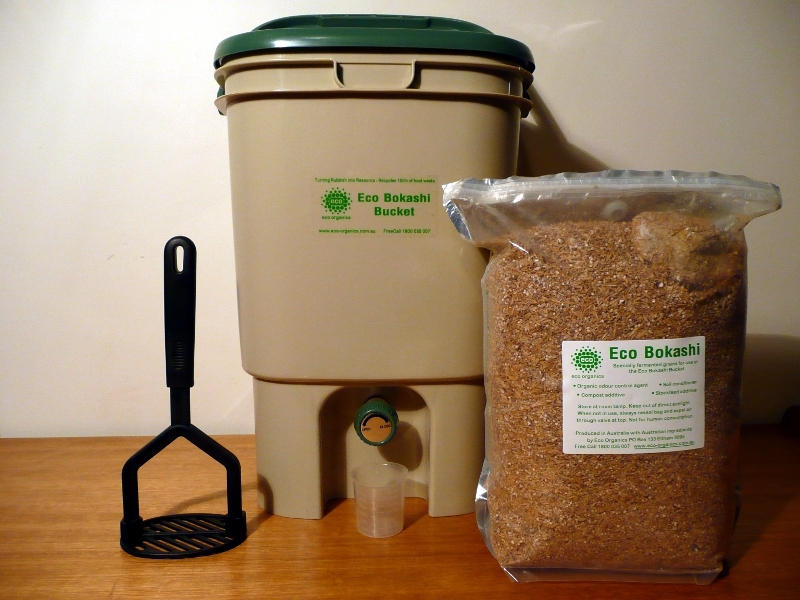 To learn more about bokashi composting you can check out these great videos online.